Glenshee’s wild mountainous terrain makes it one of Scotlands most popular ski areas. Home to the country’s largest skiing centre and some of the most breathtaking winter mountainous scenery Scotland has to offer. Glenshee Ski Centre operates the largest lift system in Britain with no less than 38 runs over three valleys for skiers and boarders of all standards. Wildlife can be spotted at this time of year as herds of wild red deer can often be seen foraging for food close to the road between Glenshee Ski Centre and Braemar. Golden eagle soar and hunt over the mountains and on high heathery ground, mountain hare and ptarmigan make their home. You’ll find a warm welcome from the locals over Hogmanay as the Glen comes alive with festivities after festivities. The skis are packed away in favour of hiking boots and bicycles. Enjoy many gentle rambles in the crisp countryside or simply admire the abundance of flora and fauna which adorns the hillsides. The landscape changes to soothing shades of green and blue. Everywhere there are relaxing views of blossoming trees, daffodils and green mountains below the sparkling clear sky. In May/June insects hatch, mammals are born and the glen becomes alive with birdsong. It’s easy to see roe deer on the hills, red squirrels and above the trees spot the buzzards mew to their mates. 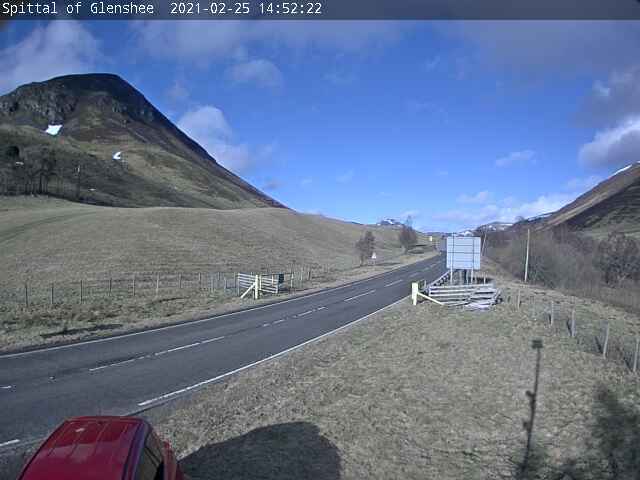 The Central Location: enjoy the local Deeside Tourist Route: a popular route from Perth to Aberdeen which goes through Glenshee to Royal Deeside and was once one of the most notorious roads in Britain with the feared Devils Elbow and its 1 in 3 gradient. Today the route has been greatly upgraded and makes a very scenic drive. Or visit local distilleries and see how some of the world's finest whiskies are made. Activities: If you prefer a more active day out, enjoy a game of golf, fishing for brown trout and salmon on local lochs and rivers, pony trekking or follow a mountain bike trail and enjoy the magnificent views and fresh and clean air. Hillwalking: for experienced hillwalkers there are many fine mountains to choose from – including the Cairnwell, Carn a Gheoidh, Glas Maol, Creag Leacach, Glas Tulaichean and Ben Gulabin. Large parking area at the ski centre. OS Landranger 43. The Cateran trail: A circular, waymarked walking route ( 63 miles/103km) through the Perthshire and Angus glens, including Glenshee. Follows the paths used by the 15th century cattle rustlers ( caterans). As the wind starts to chill and the colour of the heather adorning the hillsides changes to rich purple hues, rug up once more and enjoy a gentle hill amble. Low Level Routes include: Good estate tracks run close to the rivers in Glen Lochsie and Glen Taitneach. Both routes are also suitable for mountain bikes and are clearly shown on OS Landranger 43, NW from Spittal of Glenshee. Of an evening enjoy local hospitality round a log fire, perhaps with a warm dram and listen to the haunting sound of roaring stags echo throughout the hills and glens as the red deer rut gets into full swing. In October golden eagle and other birds of prey soar and hunt over the upland areas while, on the moorland, wild flowers flourish and red grouse and curlew make their home amid the changing colour from green to shades of orange and brown.